As usual the specifications are not entirely correct. I got it in a envelope with bubble wrap around the box, it did only include the box, there was no cables or batteries included. 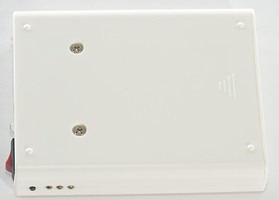 On one side of the box there is 3 small leds and a push button, this shows the charge state and if the box is turned on the white led on the front will increase in brightness giving enough light to connect something to the box, even if its dark. Most of the controls are placed on this side of the box. 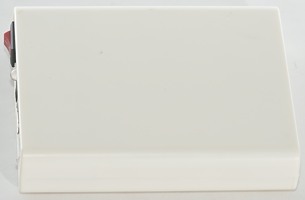 The topside of the box does not have any features, on the bottom side is two screws, remove them and the box can be opened. This means that a screwdriver is required to replace the batteries! 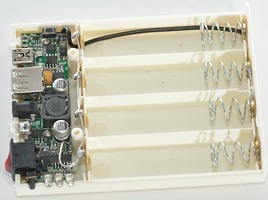 The box uses 18650 batteries and can work with 1 to 4 batteries. 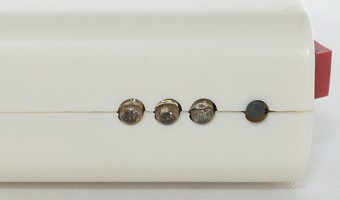 The length is limited to 68.3 mm, i.e. it will work with unprotected and very short protected batteries. 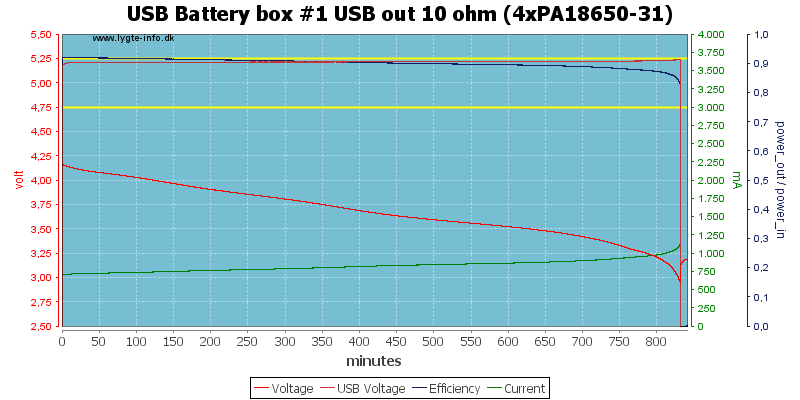 But as can be seen from my measurements, there is no reason to use protected batteries in this box. When using multiple batteries, remember that they must have the same voltage when put into the box, easiest way to do this is to charge all batteries first. With the electronic plainly visible, lets take a close look on it (Click the picture for large version). Here I have labeled all the controls. "Charge indicator" will be red during most of the charging, but will change to green when nearly finished with charging and stay green, even when fully charged. 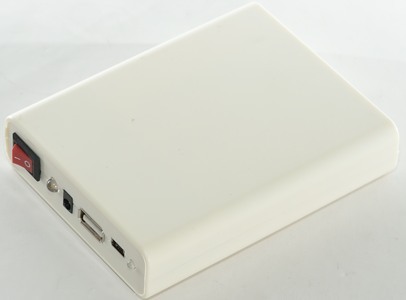 "USB input" is input from a USB power supply/charger, this charger must be able to deliver a lot of current. The connector is a mini USB. 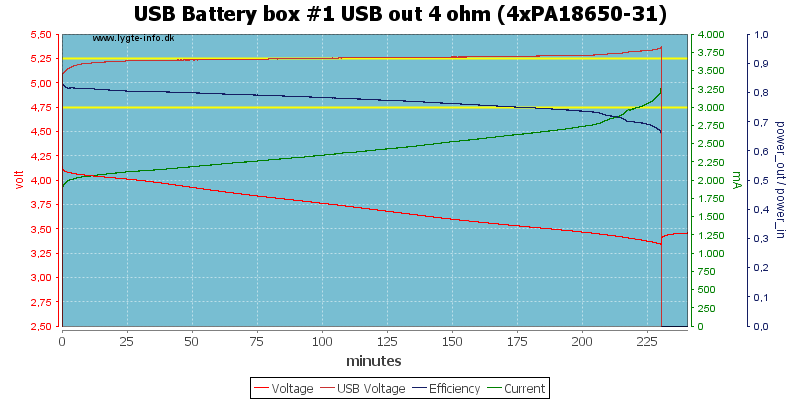 "USB output" 5 volt output for charging USB equipment. "Input" another 5 volt charge input. "Output indicator", is on when box is turned on, will increase brightness when "Show power state switch" is pressed. 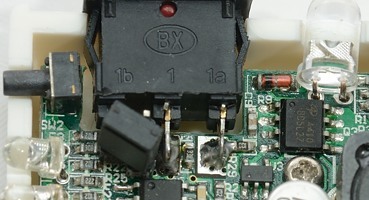 "Output on", turn on the box, i.e. 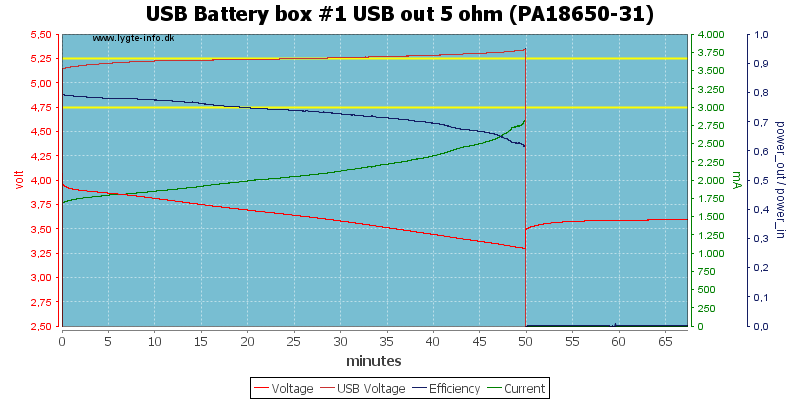 the 5 volt output. This switch will not work if the batteries are in a disconnected state. 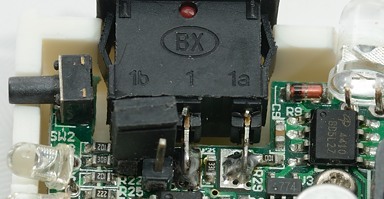 "Show power state switch" will use the 3 colored leds to show the voltage of the batteries and also increase brightness in the "Output indicator". "Power State", show the battery voltage: Red led: 3.3 volt, Green led:3.8 volt, Blue led: 4.0 volt. Generally the box is very easy to use: Put batteries in it, press the activation switch, close the box. Turn it on and connect some USB equipment to be charged. 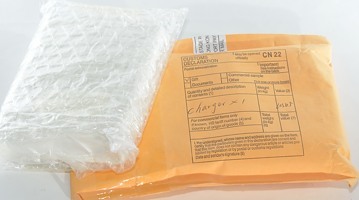 When the batteries is empty, they can either be replaced or the box can be charged from a mains powered USB charger. 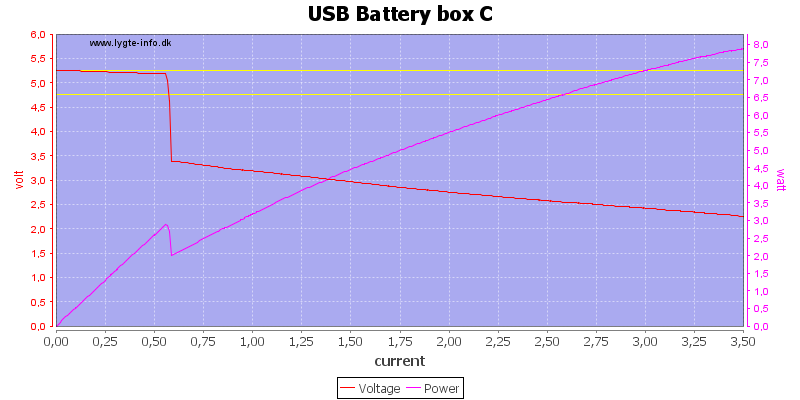 In battery disconnected state the box uses about 50uA from the battery. With battery connected and switch off the box uses about 2mA (This is about eight months with a full load of 3100mAh batteries). With box turned on, but nothing connected to USB out the box uses up to 7mA (This is about two months with a full load of 3100mAh batteries). 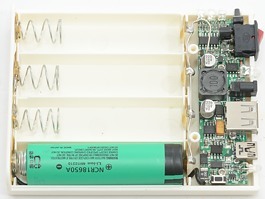 The box will disconnect the batteries when the voltage is 2.9 volt (Measured with no load). A load sweep with the jumper in the 2A position, the box will reduce current, but not turn off at 2A load. 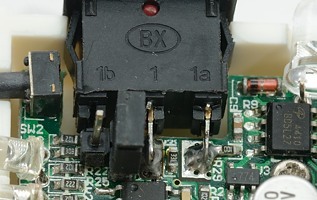 In all cases the USB output connector is coded as an Apple 1A charger. All the following curves are done with the jumper in the 2A position. With the above load sweep it looks like the box will handle 2A, this is equal to a 2.5 ohm load. This is not very impressive, the output did only work for 13 minutes. Maybe more batteries will work better. A few tests later I found out that 4 ohms (1.25 ampere) works much better. 1A with a single 18650 battery does also works fine. 0.5A with 4 batteries, does really show what the box can do: 13 hours! With a single 18650 3100mAh it runs nearly 3 hours. 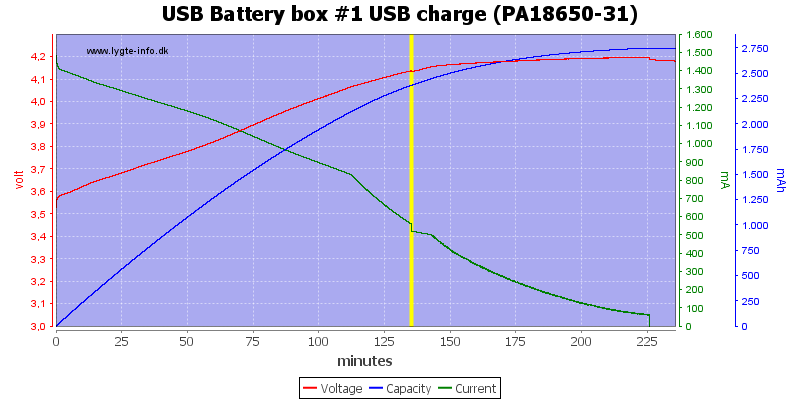 But a single 2600mAh does also run nearly 3 hours. 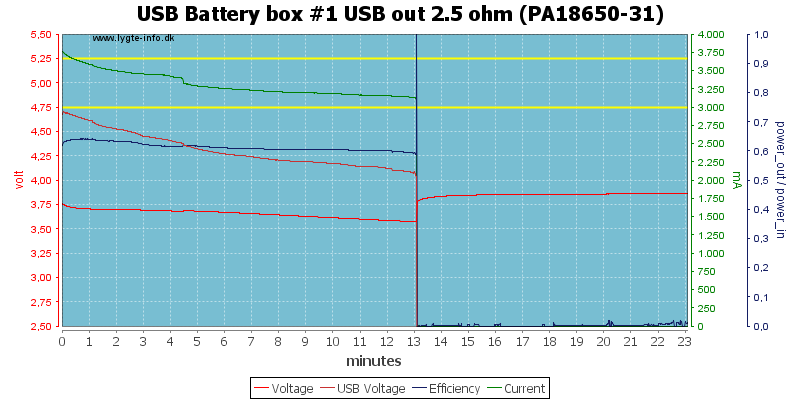 The higher voltage of this battery is the reason for this. When running with 1.25 ampere there is a lot of noise in the output (About 163 mV rms). Reducing the current to 0.5A does also reduce the noise (it is 77mV RMS). 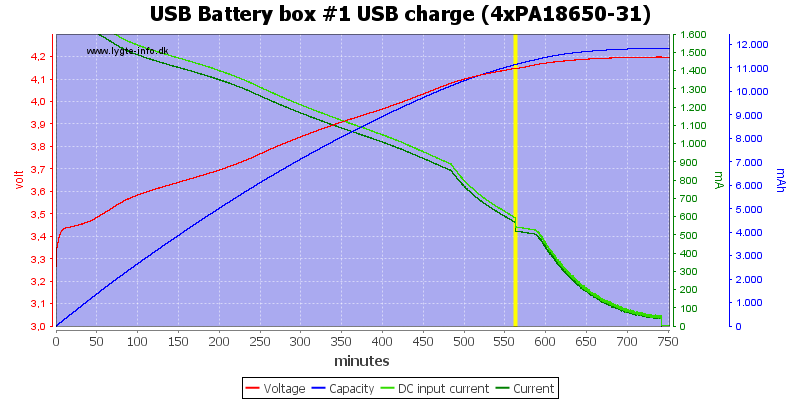 The build in battery charger starts at around 1.7A and will slowly drop during charge and terminate the charge when the current is down to about 50mA. This is not a CC/CV charge, but except for charge time (That is much longer) it is just as good. 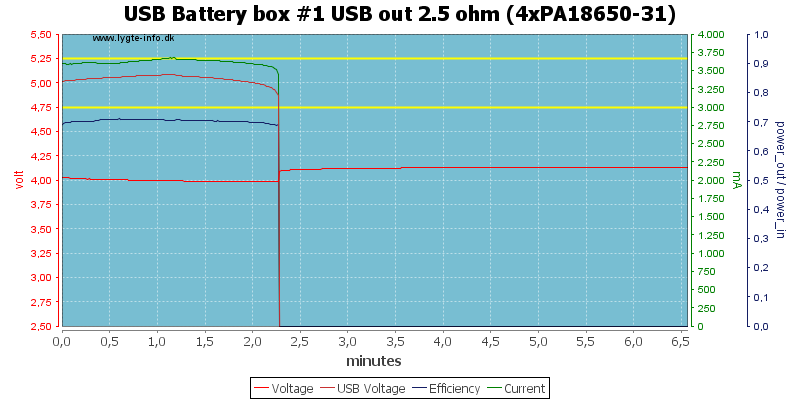 With the high current it needs a USB power supply/charger with a rated 2A output to charge, but because the current is reduced very early in the charge cycle, the charge time will be long. The yellow line indicates where the led changes from red to green. 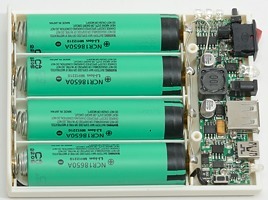 With 4 batteries the led will change to green after about 9 hours and the charge will be finished after about 12 hours. 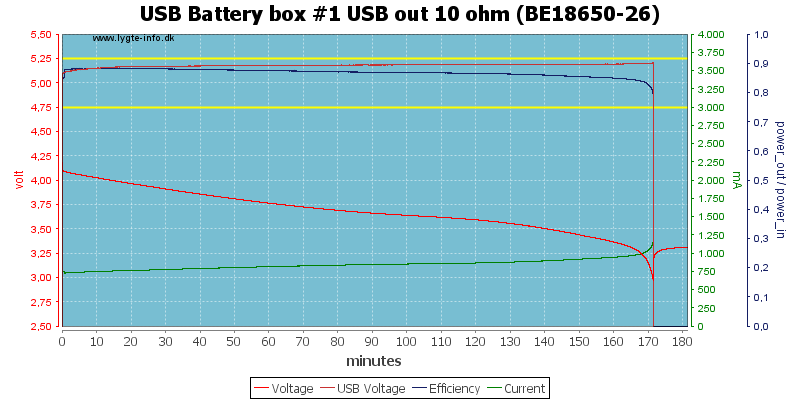 I like the idea behind this box, using standard 18650 LiIon batteries to make a USB power supply/charger. The box has many good details, but also a couple of things that could be improved. What I would like to see improved is less noise in the output voltage, an indicator showing when the battery is fully charged and faster charging (i.e. close to a CC/CV curve). More current would also be nice, but to really use that I would need one more USB output connector. I like that it will never over discharge batteries, battery indicator and that is can be used as a flashlight.